Being detained under the Mental Health Act shouldn’t mean that you lose your dignity or the chance to have a say in your care and treatment. However, research findings by Adelphi Research UK, a leading healthcare insight agency, on people’s experiences of being detained under the Act shows that all too often this is the case. 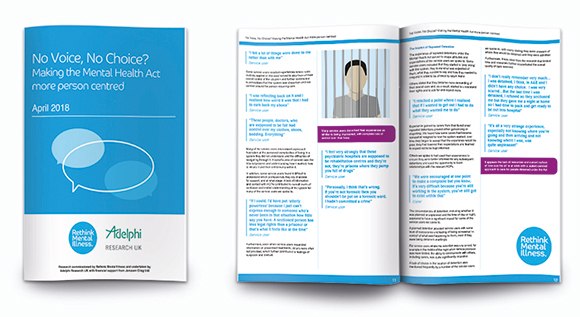 Adelphi Research UK’s report ‘No Voice, No Choice – Making the Mental Health Act more person centred’ was published by Rethink Mental Illness on 20th April 2018. ‘No Voice, No Choice’ has been published ahead of the interim report which is due at the end of April 2018 from the government appointed review of the Mental Health Act, as led by Sir Simon Wessely. The report focuses on how we can make the Mental Health Act more person centred and fit for the future. The research was commissioned by Rethink Mental Illness and undertaken by Adelphi Research UK, with support from Janssen Cilag Ltd. This research has highlighted a number of issues with the Mental Health Act as a result of what Adelphi was told by service users, carers, healthcare professionals (HCPs) and other professionals. The research found that there is a feeling that detention under the Mental Health Act takes a standard, ‘one-size-fits-all’ approach with little focus on the individual needs and circumstances of people who are detained. 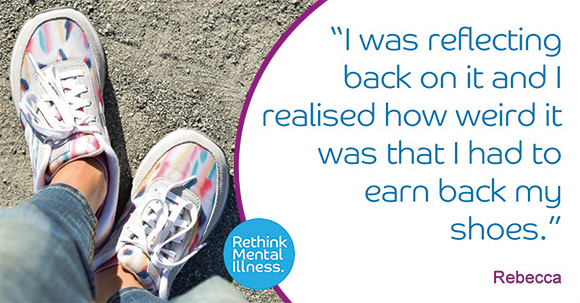 Many people described their experiences with the Act as similar to being imprisoned rather than being cared for, and one person even described how they had to ‘earn’ back their shoes while detained. From the report, it’s clear that choice, involvement and control are vital principles that should be at the heart of the care people get. “It’s great to be involved in this crucial piece of work with Rethink Mental Illness and Janssen Cilag Ltd and for this to be considered by the government’s independent review of the Mental Health Act. This is a real example of patient centricity at work and an important opportunity to make a difference in an area that is ripe for change”. Adelphi Research UK is a leading healthcare insight agency that inspires stakeholders to take action by combing innovative research methods with engaging outputs. Experts in UK market research, the agency challenges their clients to think differently by pushing the boundaries to help them drive change. Working across a range of stakeholders including big pharma, smaller biotech, patient advocacy, charities and other providers in the NHS, Adelphi Research UK’s key approaches include patient journey mapping, optimising brand communications and enabling market access. They use a variety of traditional and digital methodologies including mobile ethnography and online communities. The team at Adelphi Research UK were delighted to receive three awards at the recent British Healthcare Business Intelligence Association (BHBIA) annual conference which was held at The Royal Garden Hotel, London on 14th-15th May 2018. In an increasingly access driven NHS, it is of paramount importance that the payer perspective is not only captured but also leveraged. Our Market Access team has reflected on our extensive experience researching a broad range of payer audiences and come up with the following ‘musts’ for ensuring payer research sings. MROCs (mobile research online communities) including bulletin boards, platforms and apps have undoubtedly changed the face of qualitative research. But are we using the technology available to us in the best way possible? Based on our experience of online qualitative research with both HCPs and patients, we’ve developed our top tips on delivering a top notch online project. How Can We Make Payer Communications Really Sing? With so many different influences at play in access decisions, how can we make sure we tap into what’s really driving payer decision-making. How do we go beyond the stated drivers to understand the inherent biases at play?